This machine is used to automatically punch filter discs (frits) from a sheet and place them into each of the 96 or 384 wells of a microplate tray. The tray shown is a microtitre tray used for DNA synthesis. The filter material is cut and loaded into the holder. An empty tray is loaded and the RUN button is pushed. When the microtitre tray is filled, the machine automatically stops. For 384-well trays, 1/2 of the wells are filled then the plate and filter sheet are removed and rotated 180° so the other 1/2 can be filled. The filter sheet can be used to get 384 frits from one filter sheet, so for 96-well plates, it can produce 4 sets of frits. The frits are cut with sharpened steel tubes and set into the wells with ejection pins. Eight sets of cut tubes and eject pins are driven up/down by an adjustable air cylinder. A stepper motor drives the filter and microtiter tray nests left/right to align the tubes alternately with the proper filter sheet location and then each of the tray well columns. The punching force is adjustable for different filter materials by an air pressure regulator. Changing the cut tubes can set the frit diameter and the placement height can be adjusted by internal stops. This machine is an intermediate volume solution for filling microplate trays with small to medium size frits. Any variations within the standard 8x12 or 16x24 format on 9mm or 4.5mm centers can be accommodated through minor design changes and/or setup adjustments. The small size and simple design make it a reliable tool that requires almost no maintenance. The ability to flip the filter sheet to get 384 frits from each piece makes the best use of the material. The tubes cut more by scissor action than by sharpness, so the tubes last a long time. Higher-volume machines require expensive tooling and frequent maintenance that increases operating costs. 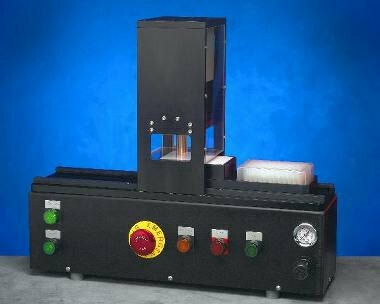 Send us your automatic frit punch specification and we will recommend the best solution for your needs. Note that being a premier machine design firm we can also customize your machine to your dream needs. Material Type, Production Rate, Process Configuration, All you need to do is ask!